Lawn Sprinkler Repair Pasco County Florida, American Property Maintenance is a lawn sprinkler repair company located in Pasco County Florida. We have over 20 years experience repairing lawn sprinklers, sprinkler valve replacement, sprinkler head repair and much more. We always provide Free Estimates and all work is warrantied for one year we also have a variety of payment options Cash, Check, Credit Cards, PayPal. We are irrigation experts your sprinkler system is a major part of keeping your grass green. Without the proper Sprinkler system your grass and landscaping will not survive. This is one of the most common irrigation repairs. With that being said a lot of home owners take it upon there self to try and fix this irrigation problem. You need a sprinkler repair company to fix this. Why? When it comes to fixing a sprinkler valve you have to dig the valve up first and if your not careful doing this your going to cause more sprinkler repairs. This is another Lawn sprinkler repair that is common. In time your sprinkler control box just goes bad. When this happens your sprinkler system stops working automatically. This does not mean your sprinkler won’t work, you can over ride the lawn sprinkler timer by turning the sprinkler valves on manually. First you need to locate your irrigation valves. Now that you have found your sprinkler valves you will see a selnoid it has two wires coming out of it. You can turn this slowly and you will see the valve start to open up. The zone that you opened will come on. Now it will not shut down until yo tighten it. Be extremely careful opening the valve and closing the valve. Sprinkler System Maintenance, this is very important and gets over looked by a lot of home owners. You should have American Property Maintenance come out at least twice a year to check your sprinkler system. We check for leaks under ground that can sometimes be overseen. Sprinkler Valve Replacement, American Property Maintenance has over 20 years experience with sprinkler valve replacement. The main reason to replace your sprinkler valves is due to age if you’ve gotten over 10 years with the sprinkler valves you have it’s time to replace them with new ones unless you have Rain-Bird sprinkler valves. Additional Sprinkler Zones Added, American Property Maintenance is the leader in irrigation designs. We have been designing irrigation system for over 20 years. When it comes to making sure your lawn is being watered properly we have you covered. Drip Irrigation is becoming more and more popular and for good reason. 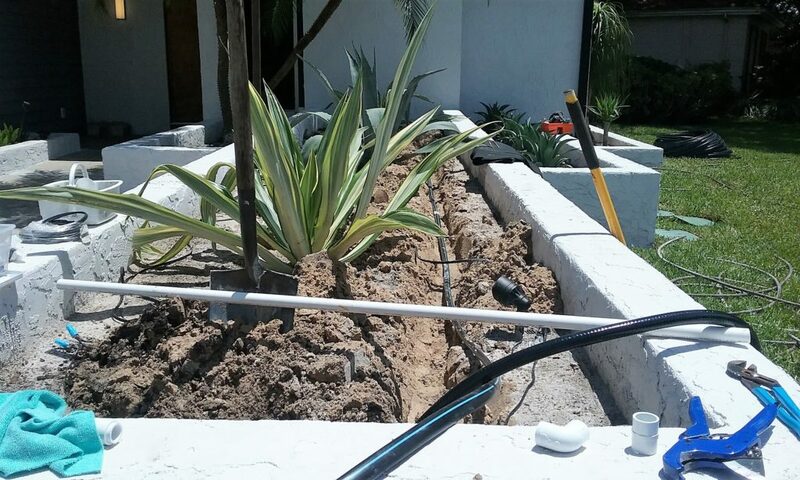 Where ever you have your landscaping drip irrigation is highly recommended. Common sense tells you plants like to have water on their roots and with a drip irrigation system you accomplish just that. Wire Location, With this service call we have to decide if locating your sprinkler wire is worth the time or if just installing new wire is the answer. In most cases we just install new irrigation wire. Now you have an idea on what goes wrong with a lawn sprinkler system. If your having any trouble with your lawn sprinklers please call (352) 277-7834 in most cases we can fix your irrigation problem the same day.